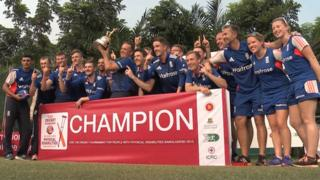 England beat Pakistan by 19 runs in a thrilling finale to win the inaugural ICRC T20 Tournament for people with physical disabilities. England were one of five teams to travel to Bangladesh for the competition. Despite losing their opening game, they went on to win the tournament. Here are some of the highlights of their memorable day courtesy of the ECB. Take a look at our guide to getting into cricket to get yourself on the pitch.